The "March Against Sharia" was scheduled to take place in more than 20 cities, including New York, Dallas and Atlanta, and was projected to be ACT for America's largest protest against Islam. In some cities, the rallies were met by counter-demonstrators. Seven people were arrested during demonstrations at the Minnesota State Capitol in St. Paul, but no injuries were reported, the state patrol said. In Seattle, police said officers deployed pepper spray to "break up a large fight" and arrested three near Occidental Park following the protests downtown. At the end of the rally, a group returned to the park where the melee erupted, according to a police statement. Officers used pepper spray to disperse the crowd and arrested one woman and two men for obstruction, it added. NBC affiliate KING 5 reported that hundreds of demonstrators had marched in downtown to support Muslims and confront a few dozen people who took part in the ACT for America demonstration at City Hall. The other group, Seattle Stands with our Muslim Neighbors, began their demonstration in Occidental Square before making their way to City Hall. In New York City, about 100 protesters and more than 200 counter-protesters traded words in downtown Manhattan as police officers stood between the groups. While they were speaking, counter-protesters were trying to drown them out using bullhorns and noise makers. “This is against all of our values,” ACT for America said in a statement Thursday. It said the Arkansas event may go forward anyway, but should not be considered sanctioned by the group. The nationwide “March Against Sharia” first gained widespread attention when Ted Wheeler, the mayor of Portland, Oregon, moved to stop the local chapter from rallying. Wheeler's decision came after two men were fatally stabbed as they tried to protect two women — one of whom was wearing a headscarf — from an anti-Muslim tirade. The organizers of Portland parade eventually changed the venue to Seattle, citing “safety concerns” in Oregon's largest city. In front of the Trump building in downtown Chicago, about 30 protesters and President Donald Trump supporters shouted slogans and held signs reading "Ban Sharia" and "Sharia abuses women," according to the Associated Press. About twice as many counter-protesters marshaled across the street. “ACT demonizes all Muslims as terrorists who want to subvert the political system in this country,” said Heidi Beirich, director of the Intelligence Project at the Southern Poverty Law Center. They disseminate lies and fallacies about Muslims to spread fear about the religion, she added. “A practicing Muslim who believes the word of the Quran to be the word of Allah … who goes to mosque and prays every Friday, who prays five times a day — this practicing Muslim, who believes in the teachings of the Koran, cannot be a loyal citizen of the United States,” said Gabriel during a course at the Department of Defense’s Joint Forces Staff College in 2007. “These marches are concerning because of what they will mean to the Muslim community,” Beirich said. “When an organization propagandizes an entire community, it tends to embolden some people to commit hate crimes." But ACT, which brands itself as “the NRA of national security,” protecting “America from terrorism,” said in a statement that the upcoming march is about “human rights” and protecting women and children from Sharia — or the religious principals forming part of the Islamic tradition — which they say is quietly taking a hold of U.S law. ACT initiated the “Stop Shariah Now” campaign in 2008. The SPLC said the group's website described its mission “to inform and educate the public about what Shariah is, how it is creeping into American society and compromising our constitutional freedom of speech, press, religion and equality what we can do to stop it." “It is absolutely impossible for any religious law to take over U.S. law,” Beirich said. “The Constitution stops it, there is a separation of church and state,” she said. Another staple of the group is the Thin Blue Line Project, which is a “Radicalization Map Locator” that lists the addresses of almost every Muslim Student Association (MSA) in the country, as well as a number of mosques and Islamic institutions. The project, accessible only to pre-registered law enforcement, describes itself as a “one-stop internet resource for information concerning the perceived threat of Muslim infiltration and terrorism in the country,” according to the SPLC. “If you or someone you know is aware of a church or synagogue involved in or considering interfaith outreach, please warn them about organizations and individuals connected to the Muslim Brotherhood,” the organization said in a 2012 statement. The group campaigned hard for Donald Trump, and after he won the election, they boasted of having a “direct line” to the president. Gabriel even visited the White House and tweeted she was going there for a meeting. Former national security adviser Michael Flynn and current Trump adviser Walid Phares are ACT board advisers, according to the organization. And CIA director Mike Pompeo is “steadfast ally,” said Gabriel in a letter to her base. 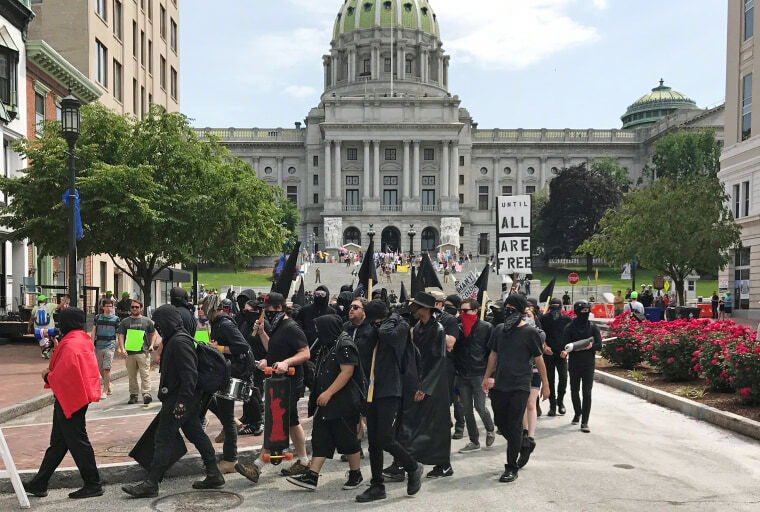 The nationwide march is one of the largest coordinated efforts by the ACT, despite a small expected turnout based on the event’s Facebook page. As of Friday afternoon, only 50 individuals said they are going in Atlanta, 64 in Indianapolis, and 68 in Chicago, on the event’s social media page. “The protest being planned ... by a designated hate group are only designed to fan the flames of hatred and promote xenophobia incidents like what happened in Portland across this country. This is not a rally FOR anything; it’s a rally AGAINST Muslims and American values,” said Rabiah Ahmed, a spokeswoman for the Muslim Public Affairs Council. “We know that the views expressed by these hate groups do not reflect the vast majority of Americans," she added, "and we know that groups like this are only blinded by their extreme hate and ignorance."